The magnetic instruction sets of our DNA have yet to be discovered (and "proven") by science. Kryon has spoken of them in the channellings by Lee Carroll and I wish to touch upon it here. 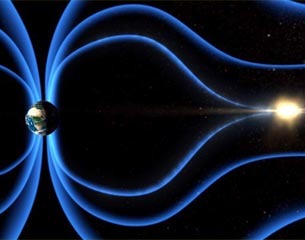 Within the magnetic structure of our DNA, not only do we have our biology but also our karmic overlays (lessons from past lives/other lifetimes) and the exact magnetics of when we were born. One of our magnetic imprints is a snapshot in time of where the planets were positioned in our solar system at the time of our birth. This imprint is transferred to us by earth's magnetic fields which constantly interact with and receive information from the solar winds. There is a constant stream of communication going on at the DNA level that our modern day science is not yet aware of - and yet the ancients were very aware of it. Today, however, we can appreciate how huge amounts of information is transferred wirelessly in the blink of an eye. Let's use this awareness to get past our own limited perceptions of ourselves and what we're capable of. This magnetic attribute of DNA gives us the mechanics of how astrological information is transferred to us and is something we carry around with us all our lives, whether we acknowledge it or not. This is why an adept astrologist can read a person's natal chart and give startlingly accurate information on their past, present and future energy potential for this lifetime. Astrology is one of the oldest sciences and deserves respect. Indeed, at one time Astronomers were Astrologers also. Unfortunately, popular astrology is rarely helpful to the individual's quest to understand himself or herself, and only serves to discredit the valuable work of those who take the time to read the energy of the human sitting before them. If you're really interested in Astrology, find out your time and place of birth as accurately as you can and seek out a seasoned astrologist who can give you insights into your character and the potentials you have lined up, both good and bad. One word of caution, however: don't buy into any fear! Difficult potentials that are discussed during an astrology reading should be addressed in ways that are helpful to you. Spirit will not give you a difficult situation without the tools and ability to overcome it. If someone is putting you into fear, leave! Use discernment and own your power at all times. Astrology is a map of your own energy potentials but you get to make the choice as to which ones you activate.